WEST LAFAYETTE, Ind. — Purdue is taking an active role in providing aid to the victims of the devastating earthquake that hit Haiti on Jan. 12, 2010. The Athletics Department has designated the Feb. 20 men’s basketball game versus Illinois and the Feb. 25 women’s game against Michigan State as an opportunity for fans to donate. Team chaplain Marty Dittmar will take a team of 24 Purdue student-athletes to build homes in Haiti in May. Team chaplain and FCA advisor Marty Dittmar will be taking a team of 24 Purdue student-athletes to Haiti in May to help build homes for the approximately one million Haitians left homeless by the quake. To help raise funds for the construction of these homes, members of Purdue’s football, basketball, volleyball, golf, baseball, tennis and swimming and diving teams will be at the exits of Mackey Arena with green collection buckets at the conclusion of the two games. Although no specific fundraising goal has been set, each home built will cost approximately $3,700 and Dittmar and his team would like to build as many homes as possible to offset the loss of the nearly 250,000 domiciles destroyed by the earthquake. Dittmar has been taking Purdue students to Haiti for 17 years, often making two or three trips a year. He has had student-athletes on the mission trip the last five years and has taken teams comprised primarily of student-athletes the last two years. 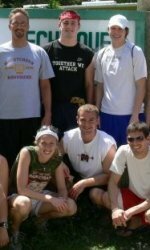 For more information on Dittmar’s 2009 FCA mission trip to Haiti, click here. The first donation opportunity will occur when fourth-ranked men take on Illinois on Saturday, Feb. 20, at 4p.m. in Mackey Arena and also will be accepted at women’s basketball’s senior night versus Michigan State on Feb. 25 at 7 p.m. Fans unable to attend either contest may drop off or mail a check to the Purdue men’s basketball office, women’s basketball office or the football office anytime before or after the collection dates. All checks should be made out to EBM and a tax-deductible receipt will be mailed if a name and address are provided.